The UK's Lotto game regularly offers some very good jackpots, particularly when you take into account the large £1 Million 2nd tier prize (Match 5 + Bonus). Prizes are paid out tax free, and as a 6 balls from 59 game it does offer odds which are better than some other big lottery games. It's not the only UK game of course, but definitely the most popular for syndicate players. LottoLand Syndicates LottoLand has taken the UK by storm. Well now they have some pretty impressive syndicates to choose from too. In fact, loads of them. You Play We Play UK based professional lottery syndicate playing UK Lotto with 'pay as you go' options at just £3.00 per draw. Free to join. 'Play Lottery' BFL have plenty of professional experience managing syndicate groups for UK Lotto, EuroMillions and Spanish Superdraws, starting at just £5 per week. Love My Lotto Syndicate A 'multi-lottery' syndicate covering UK Lotto, EuroMillions, Plus5, Daily Draw and more. Starts at just £12 per month. Lotto By Text Play the UK Lotto or EuroMillions by text from your mobile phone. But terrible value for money. The UK's National Lottery is currently run by Camelot. The first draw was made on UK National TV on Saturday 19 November 1994. The company name - 'Camelot' - also explains the curious King Arthur naming convention of the draw machines, i.e. Merlin, Arthur, Guinevere, Lancelot etc. What UK Lottery Games Are There? The main draw, simply called Lotto, is a 6/59 game - that is, pick 6 numbers from a choice of 1 to 59. Six balls are therefore drawn, plus a bonus ball. It started as the only game available, drawn just once a week on a Saturday. But there have been numerous new games introduced since then - Plus 5, Lotto HotPicks, Thunderball and of course EuroMillions. The main Saturday Lotto game was expanded to include a Wednesday Lotto draw in February 1997. Camelot have also published a wide range of regularly updated scratch off lottery tickets. These are issued under the name Instant Wins, or 'Instants'. It's a very rare event for the UK to add a new game to their line up. By that I mean a real new game, not just a tweak or add-on to an existing game. So it's quite exciting to see Set For Life announced. Mainly because this is actually a good game, that isn't heavily focussed on big rollovers and oversized jackpots. Instead it pays out a jackpot of a fixed annuity of £10,000 per month for 30 years (£3.6 Million in total). There isn't even an option to take it as a lump sum. The game is a 5 numbers from 47 game, with an additional 'Life Ball' numbered 1 to 10. 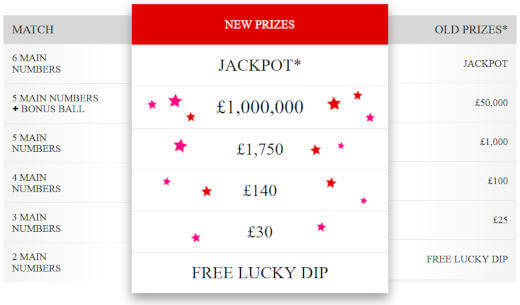 You have to match 5 + the Life Ball to win the £10,000 per month. The draws will be made every Monday and Thursday. Tickets go on sale on 15th March 2019, with the first draw to be held on 18th March 2019. How Has The UK Lotto Changed? As with many lottery games, the UK Lotto is always being evaluated and does change format from time to time. Some like the changes, others would prefer they just stop changing things around! But overall the changes do seem to re-invigorate the game each time. Note: these most recent changes applied from 21st November 2018. The latest round of changes have been made after listening to players feedback. They are a bit of a mixed bag, but overall an improvement. Match 5 + Bonus prize is now £1 Million - Yay. The 'Lotto Raffle' has ended - Boo. Fixed prizes for Match 3, 4 and 5 have increased slightly. Rollovers are now limited to 5 maximum. Must Be Won Draws (5th rollover) now roll down to ALL prize tiers. Starting jackpots have increased slightly. The most noticeable change is that the 2nd tier prize (Match 5 + Bonus) is now a fixed (not shared!) prize of £1 Million – up from £50,000. But of course we no longer have a £1 Million Raffle prize anymore (or those 20 x £20,000 Raffle prizes). It's also worth noting that all the fixed prizes are 'capped'. So in the rare event that a lot of people win in the same draw, the payout could be smaller. It's nice that rollovers have now been limited to a maximum of 5 (previously a fixed £22 Million). But there is a less visible rule change for the amount that previously just 'rolled down' for this final "Must Be Won" draw (if nobody got all 6 numbers). That's now shared across all prize tiers, with the majority (74% of it) going to the Match 3 tier. The base starting jackpot amounts have also increased slightly - they are now £2 Million for Wednesday (up by £200,000), and £3.8 Million for Saturday (up by £700,000). This was the year that introduced another highly controversially change to the game. On 10 October 2015 for the first time the pool of numbers for the UK Lotto changed. Up until this time players has always picked 6 balls from 49. This was increased to 6 balls from 59. At the same time the prize tiers were adjusted slightly, together with the addition of a new prize level for matching 2 main numbers which paid out a free ticket. The more important improvement however saw the addition of £1 Million prize to the Lotto Raffle, alongside 20 x £20,000 prizes. This applied to both weekly draws. It was October 2013 that controversially saw the ticket price double from £1 to £2. These changes also introduced the add-on Lotto Raffle game, included in the ticket price. The main draw itself remained the same, but the prize structure was also adjusted (you can read full details of the new UK Lotto game here). The Raffle actually replaced the 'Plus 5' add-on game, and introduced an additional 50 randomly allocated prizes of £20,000. Each line bought for the main Lotto draw included a Raffle entry 'number' (actually a 4 letter colour, follow by an 8 digit number, e.g. 'NAVY 1234 5678'). What Are The Prizes For The UK Lotto? The main Lotto game has always been by far the most popular UK only game, in particular the original Saturday draw. 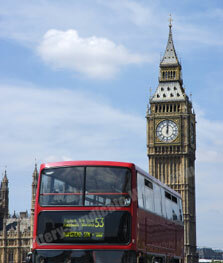 But EuroMillions has proven very popular with the British public and has been growing strongly. It also remains to be seen how players really feel about the restructured game. There are now 6 prize tiers for the Lotto game, ranging from Match 2 to Match 6. 1) Jackpots are a guideline, and can often be significantly higher due to rollovers (see below). 2) All prizes are now 'fixed amounts' but do depend on 'capping' so may be less on rare occasions with lots of winners for that prize tier. Except the Match 2 prize being the free lucky dip ticket. How Big Does The Jackpot Get? The jackpot size does of course depend on the number of tickets sold, as well as how many times the jackpot has rolled over. But it normally starts at £2 Million on a Wednesday and £3.8 Million on a Saturday. But with rollovers (now limited to a maximum of 5) regularly reaches greater sums. The largest jackpot so far was won on 9th January 2016 at £66,070,646 - which was split between 2 different winning tickets. As with most lottery games, if two or more people match all the winning numbers, they then share the jackpot equally. This jumbo jackpot was actually paid out after the 'Jackpot Cap' rule was applied. This rule, now replaced, stated that whilst the jackpot does not have a limit on the number of times it can rollover, once it reaches a cap level of £55 Million it is then guaranteed to be paid out on the following draw. If nobody matched all 6 main numbers on that final draw, then the prize 'rolls down' to the next prize tier (and will roll down even further if there is no winner matching 5 main numbers and the bonus ball). 21 Nov 2018: New rule changes come into play with a £1 Million Match 5 + Bonus prize, and the retirement of the Lotto Raffle. 7 Jan 2017: No more live draw on BBC One. For the first time since being launched, the live draw is dropped from being broadcast on BBC One. It can still be seen live on Facebook and iPlayer though. 9 Jan 2016: A new record jackpot win hitting £66 Million, shared between 2 tickets. 10 Oct 2015: UK Lotto Reboot 2015 - the pool of numbers changes from 49 to 59, plus a new £1 Million Raffle prize. 5 Oct 2013: The New Lotto arrives. 1 sole winner claims the first £10 Million promotional draw jackpot. Plus 1,000 other winners collect a £20,000 Raffle prize. 2 Oct 2013: The final 'old' draw takes place, to make way for the all new UK Lotto game starting on 5th October with the first of two huge special launch draws. 22 Jan 2013: Camelot reveal plans for major changes to the UK Lotto game - players however are far from happy. 26 Oct 2012: Camelot announced the National Lottery has now created 3,000 millionaires in the UK. 29 Sep 2012: First ever quadruple rollover jackpot on the UK Lotto. 28 Aug 2012: Audible alerts to be added to terminals in the UK to try and prevent shop based ticket fraud. 12 Jan 2012: 19 year old Eloise Hutchinson wins £1,346,840. 7 Oct 2011: ASDA syndicate win £6,873,588. 12 Jul 2011: Camelot celebrate 222 Scottish Millionaires. 21 Apr 2011: Group of 16 cleaning ladies from County Durham celebrate £4,091,609 win. 20 Apr 2011: Rugby syndicate celebrate £4,091,609 from a £1 Lucky Dip ticket. 5 Feb 1997: The Wednesday draw is added to the main Lotto game, making two draws per week. The official site for the UK's Lotto game is www.national-lottery.co.uk. This is also the official source for results and some of the other major UK games. Lotto 28 A small but low cost UK lottery syndicate with some really great features. eLottery Syndicate The grandaddy of commercial syndicates, eLottery Syndicate was our firm favourite. UK Lottery Pools Group One of the cheapest commercial lottery syndicates to access, with sensible options and low admin costs. When joining a lottery syndicate always consider the game being played first. It's no good getting 50 times the chance of winning if you end up playing a game that's 100 times harder to win! The UK Lotto is a good game for playing in a syndicate.